You’d think that this stretch of Highway 11 would be a bit more populated being in cottage country, but it’s not. I guess once you get north of Huntsville, northern Ontario beckons. Scotia is another hamlet that I know I have driven past, and maybe even through, but haven’t stopped long enough to take out the camera and the notebook and make a stop of it. I couldn’t find anything on the web since searching “Scotia” or “Scotia Ontario” just brings up the province or the bank of the same name. In October of 2008 I veered off Highway 11 to check out Emsdale, Scotia, and Novar. I didn’t end up seeing a sign for Scotia, although I did pass a dirt road named “Scotia Road” which had a barn and a couple of houses on it. Novar is a collection of three or four little streets north of Melissa founded in the late 1800s. Novar has walking and hiking trails to the local rapids. There is also snowmobiling, canoeing, and kayaking as well, just preferably not in the rapids. There is also access to the Seguin Park to Park trail. St. Andrew’s Presbyterian Church is also a sight as it was built in 1895. There is a historical cemetery as well. Novar has a little grocery store with an LCBO outlet, a gas station, the Tea Kettle Campground, and a bed and breakfast called the Country Colonial. I’ve driven through the area a number of times, and recently I went off Highway 11 to explore Novar. It was pretty small though, and being mostly houses, I didn’t feel totally comfy taking photos, so I don’t have any photos. Melissa is a bit confusing as there are two Melissas in Ontario – one near southern Georgian Bay, and one in the Muskokas. Unfortunately, I couldn’t find anything on the internet about Muskoka Melissa (Doesn’t that sound like the title of a bad April Wine song?). I didn’t remember driving through it or seeing any signs for it past Huntsville. I drove through the area recently, and there is a sign on Highway 11 for the town. The town is to the west of the highway. I didn’t take a detour, since I had made stops in Sundridge, Emsdale, Burk’s Falls, and North Bay on the same trip. This entry was posted in Muskoka and tagged dot on the map by Highway11.ca Editor. Bookmark the permalink. Before Hwy 11 was widened to 4 lanes about 15 or so years ago, the sign for Melissa was on the side of the highway. Now the 100 kph traffic roars on by with no indication that she’s even there. Ive never been there, however I too was named after this village. My mother used to pass by on her way home up by Kirkland Lake. Maybe some day I’ll make the trek. Melissa was never a town but was a ‘locality”. It had a post office in the Shaw farmhouse about .5 km west of Hwy 11 until the late 1960′s. As a child spending the summer there with my grandparents I dragged the outgoing mailbag to the “mail arm” where it was snapped off by the afternoon northbound passenger train as they threw off the “incoming” bag. The CNR trestle over Jessops Cr. north of Melissa was filled in one summer by means of hundreds (thousands?) of gondola cars of gravel being dumped on top. 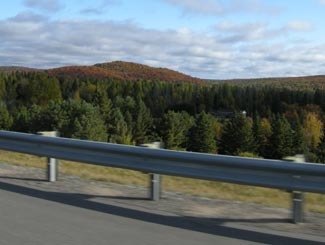 The “Beaver Hall” on 2 lane Hwy. 11 was the local social centre until the 50′s when the first highway widening caused its demise. ***Also Scotia was “Scotia Junction” where the OAPS (Ottawa, Arnprior & Parry Sound” east-west railway crossed the CNR until its tracks were torn up in the 50′s. There was also a sawmill and railway siding until the 1950′s. Logs trucked in and the lumber going out by rail. It’s never referred to as ‘the Muskokas”, the correct wording is simply “Muskoka”. Correct wording should be “Melissa is a bit confusing as there are two Melissas in Ontario – one near southern Georgian Bay, and one in Muskoka”. Was in Kapuskasing, Onatario for one year,in 1958, loved it, Was stationed on a Radar Site at Lowther, Ontarion. I am named after the town Melissa, my middle name is from a Lake up near Temagami. My parents used to make the trip from Toronto to Englehart several times a year, stopping at every lake to fish on the way up. When I was one, we moved from North York to Sprucedale. I am now reading a book called “A Track Through Time” by Janice Madill. It outlines the settlement of the area via the pioneers and it is very enlightening. I used to think of that area as tiny and insignificant but I was very wrong! You may like to read the book if you get a chance. I bought it from the Community Centre in Sprucedale. They offered to post it to me and I posted them a cheque. I am going to look at the Perry Township website suggested above also. IF YOU GO TO THE PERRY TOWNSHIP WEBSITE, YOU WILL FIND THE HISTORY OF NOVAR, SCOTIA AND EMSDALE, ONTARIO. VERY INTERESTING HISTORY, NOVAR WAS ORIGINALLY CALLED CYPRUS AND WAS ABOUT 5KM NORTH OF PRESENT VILLAGE AND SCOTIA WAS ACTUALLY A RAILROAD TOWN, WITH THE RAILROAD STATION THERE. SCOTIA HAD 3 HOTELS GAS STATION AND MORE, EMSDALE IS RICH WITH HISTORY TO! JUST HAVE TO LOOK ABIT FOR IT, BUT LIKE I SAID PERRY TOWNSHIP WEBSITE IS A GREAT PLACE TO START. The town of Melissa existed before hwy 11 was twinned. In the late 90′s the town was pretty much demolished to make way for the new highway. There is no sign for the town anymore, however I remember driving by during construction and there was one going northbound. lol the town of Melissa consisted of one building.. it was a combination drug store/restaurant./gas station./ laundromat.. It had a sign on one side of the driveway saying welcome to Melissa.. the other side was a sign saying you are now leaving Melissa.. I grew up there.. on Lake Palette, which was named such because of the shape of it. It looked like a painters palette topographically.. It was pretty much all just my family for years there..Hunts family was well known all over that area.. I was up there a couple of years ago, I seen no sign of any store, but I did see a nice fairly big sign saying Melissa on the road after you turned in off of yonge street or #11 as I call it..It has certainly under gone a whole lot of changes up there over the years.. Although it still is a very small place, and very few people have ever heard of it lol..I have a T-shirt which my neighbour bought me after taking a drive up there one year to see where I grew up.., and couldn’t find it.. It says where the hell is Melissa lol.. I sure miss the tranquility of it..I miss the icey cold spring water that came down out of the hills right through our house..Originally we were the only ones to have tapped it onto our basement so it came right up into our taps god it was delicious.. My dad lived there until he passed away..as did his sister and brother inlaw..Wonderful memories.. I grew up in Melissa, which was a hamlet 7 miles north of Huntsville. My dad worked at the International Ceramics plant in Melissa, down the hill and across the Little East River behind the RockHaven store and gas station owned by Mr. and Mrs. Grimes. Across the road and up the hill on the way to Waseosa was Sam McLean’s sawmill. In Grade 1, I went to the Melissa School, a one-room schoolhouse about 1 1/2 miles south, behind O’Halloren’s farm and up the hill by the old North Road. As a six year old, I had to walk to school and home every day. It was a great day for us when we started to ride the bus later that year. They closed the school in 1950 and bussed us to the Chaffey Township school, the so-called “Chicken Coop”, just south of Huntsville on old Highway 11. I know this is an older blog, but we are looking for a picture of the old train trestle that used to be in Melissa. It was filled in when I was still in school. I know at least 2 people that would like to get such a picture. Yes, there really is a Melissa. I’ve lived here since 1968 and still do. It will always be Melissa to those of us that know it. I know of people that named their daughters after out beautiful little hamlet.